After taking a quick glance at any Tech football social media account, it is evident that there is fresh energy in the air. New traditions, different plays and unfamiliar voices mark the first few days of spring practice as Coach Collins carves out the path that he sees fit for his team. In the wake of Coach Johnson’s well-known offensive and defensive formations from which there was rarely deviation, Collins is shaking things up for the players as a the 2019-2020 season sparkles on the horizon. The Jackets kicked off their first practice on March 26 with energy and high expectations from their coach. In a video posted on the Tech Athletics website highlighting the beginning of the spring season, Collins says, “I am going to challenge you because I expect every person in this organization to be elite.” The short video contains the normal hype and chill-inducing elements that are expected of Tech media productions, but the excitement that the team shows is undeniable. In a press conference posted online, offensive coordinator Dave Patenaude stated that the team would remain “balanced” in changing from Coach Johnson’s triple-option offensive formation to Collins’ new plans. He mentioned the idea of “playing to the strengths of the quarterbacks and the offensive line”, while capitalizing on the fact that the Jackets have very “athletic” quarterbacks to utilize, such as redshirt junior Lucas Johnson, redshirt sophomore Tobias Oliver and redshirt freshman James Graham. Patenaude believes that the three scholarship quarterbacks expected to vie for the starting position are good at throwing the ball, something that each of them have been hindered from showcasing at a high level under Coach Johnson. On the second day of practice, the coach said, “We look like a spread team,” while attributing that fact to the team’s dedication to learning new plays in the offseason. Lucas Johnson, making a comeback after a season on the sidelines due to a leg injury sustained during last year’s first preseason scrimmage, is the favorite for the Jackets’ starting position going into the fall, though Oliver and Graham are expected to be in the running for the position too. Leading up to the season, the coaching staff went through positions that had been understaffed in previous years. This included the movement of redshirt senior Tyler Cooksey to the tight end position from special teams. Cooksey and others who have moved to similar positions will see a higher frequency of running action than the players have seen in recent years, a nod to the transition away from the triple-option formation that Coach Johnson favored. Patenaude and Collins are also big on “cross-training”, or creating versatile players that can serve the team offensively and defensively. Tech will sorely miss Parker Braun and Andrew Marshall, valuable members of the offensive line in previous seasons, and their absence leaves a hole for senior offensive linemen Jahaziel Lee, Brad Morgan and Kenny Cooper. A fourth versatile offensive lineman that will add valuable experience is Vanderbilt transfer Jared Southers. In addition to the seniors, the depth of the underclassmen linemen such as redshirt sophomore Zach Quinney and redshirt freshman Zakk McKeehan should be sufficient in years to come. On the other side of the ball, Tech’s D-line is expected to be led by junior defensive lineman Antwan Owens and redshirt senior defensive lineman Brentavious Glanton – solid starters who combined for 54 tackles last year. 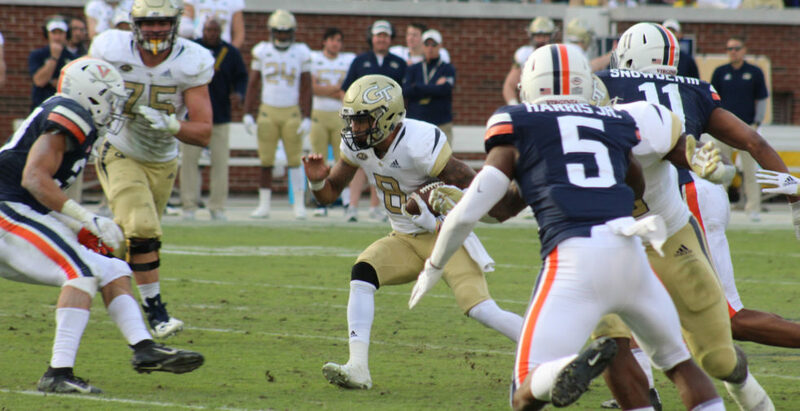 Tech’s first spring game under Collins is scheduled for April 26, though Tech’s calendar is fairly clear until the Jackets open up the 2019 regular season at on August 29. This game will be a Herculean challenge, but will be a testament to the work that the team and Collins’ coaching staff continue to put in leading up to August.